You used your treasonous Mutant Power to melt that High Programmer into goo! We know it was you. No loyal citizen in Alpha Complex would crush The Computer's trusted friend. Only a Mutant, an inhuman traitor with unnatural powers, could manipulate gravity - or cast radiation - or control a warbot and make it fire - or whatever you did. Mutie. My partner here, he's not as nice as I am. He'd just as soon put you straight on Freak Suppressor and fit you with an anti-psionic enforcer. Me? I'll help you if you help me. 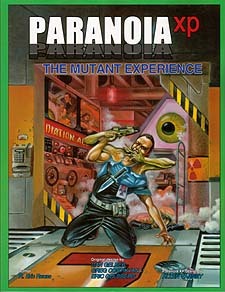 Creatively mutated new rules and powers for Paranoia XP. What's that you say, Paranoia Gamemaster? The roster of mutations in the Paranoia XP rulebook lacks the exact powers you want to inflict on your Troubleshooter players? You're looking without success for the mutations Acidic Spit, Adaptive Metabolism, Bouncy, Call Bots, Chromativariation, Clean Slate, Creeping Madness, Cryokinesis, Enervating Darkness, Environmental Control, Find Location, Forgettable, Gravity Manipulation, Haze, Hyperreflexes, Jump!, Light Control, Magnetize, Mind Sense, Pouches, Psychometry, Push Mutant Powers, Radioactivity, Scream, Sculpt, Second Skin, Speed, Spikes, Stasis, Stench and Stretchy? You want new ways to handle the existing stuff too? Relief is at hand, Gamemaster. Acquire, by any legal means, this fine 72-page rules supplement, The Mutant Experience! * Three dozen new mutant powers! Variants of existing powers! * New rules to ignore! Fun and terrifying new Alpha Complexes! * Mutagens, equipment, medications! Edible Perversity points! You need the Paranoia XP roleplaying game to use this book.